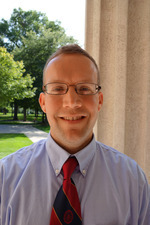 Andrew McDonnell is the Director of Communications at Wayland Academy, Beaver Dam’s own co-educational college preparatory boarding and day school. His freelance writing has appeared in the Isthmus, Notre Dame Magazine, McSweeney’s Internet Tendency, and A Prairie Home Companion with Garrison Keillor. There are few things as unnatural to a human being as breathing underwater. To some, the notion is too terrifying to consider for very long. To others, it is a phenomenon akin to a superpower, a form of magic. The ancient Greeks created Triton, merman son of Poseidon, with the fins of a dolphin and the torso of a man who breathed as easily in water as he did in open air. Author J.K. Rowling created Gillyweed, an edible plant that allowed Harry Potter and his classmates to breathe comfortably underwater through freshly sprouted gills and swim easily with newly webbed toes and fingers. While Wayland Academy Spanish teacher Mike Schneider may deny that he is the offspring of Poseidon or the creation of author J.K. Rowling, the man is, nonetheless, most assuredly comfortable breathing underwater. Training is a two-part process. Before students can catch a glimpse of the water, they have to study a diving manual thoroughly and pass a written exam to demonstrate a clear understanding of numerous concepts and skills. Daunting scenarios are studied such as “What to do when someone kicks your mask off at a depth of 100 feet underwater,” and “What do you do if you run out of air?” After students have demonstrated written mastery of the subject, Schneider and Lauth work with them to master 20 essential skills in the Sol Wolfe pool at Wayland Academy. The pool provides students and instructors a controlled, safe environment where they can practice maneuvers such as “remove all breathing apparatus while submerged, and then, put it back on.” After passing the pool assessment, students must complete four dives in an open water environment such as a quarry, a lake or the ocean, demonstrating all 20 of the essential skills in order to receive their SCUBA certification. This must be done over at least two separate days. Schneider has traveled with students to complete their certification in Devil’s Lake, Redgranite Quarry and Wazee Lake. Over the past 13 years, nearly 200 members of the Wayland Academy community, students, parents, faculty, staff and administrators, as well as neighbors in Beaver Dam, have become certified in SCUBA diving. Thanks largely to Lauth and Schneider’s efforts and enthusiasm, the SCUBA bug runs rampant through Wayland. Almost a quarter of the Wayland faculty is now either certified or currently in the process. Schneider has helped certify his wife, as well as his daughter Beth Ratajczak who teaches biology at Wayland and her husband Tyler. Beth and Tyler have continued on to earn advanced certifications. Schneider also helped train his dentist Dr. David Stecker, and last year, Schneider and Lauth trained firefighters from the Beaver Dam Fire Department who were hoping to work their way up to rescue diving. Keith Lauth can be contacted at lauthk@hotmail.com for more information about the SCUBA diving certification program at Wayland Academy.